Former Hawkeye and NFL star's donation will brighten patients' stays at UI Stead Family Children's Hospital. 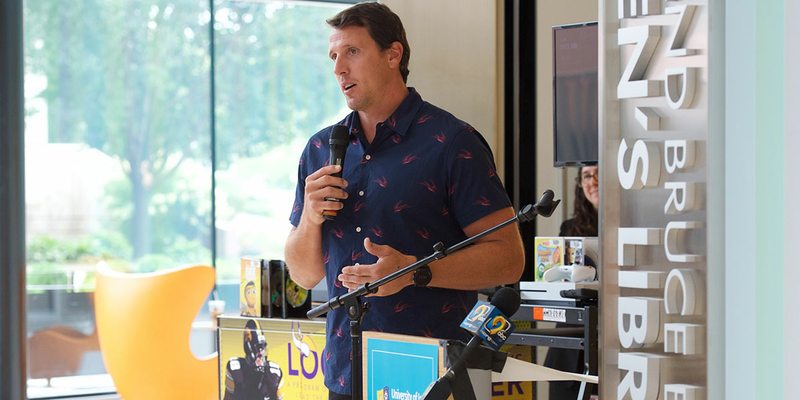 Photo: Susan McClellen, UIHC Former Hawkeye All-American and retired Minnesota Vikings linebacker Chad Greenway speaks Friday, Aug. 31, inside UI Stead Family Children's Hospital. Greenway was on hand to cut the ribbon for “Chad's Locker,” a trove of movies, games, and iPads donated by Greenway's Lead the Way Foundation to entertain hospital patients. Chad Greenway was known as a difference-maker for the Iowa football team, becoming one of the best linebackers to ever play at Kinnick Stadium. Fifteen years later, he’s now making a difference next door at University of Iowa Stead Family Children’s Hospital. Greenway (05BA) and his wife, former Hawkeye track and field student-athlete Jennifer Capista Greenway (05BBA), returned to their alma mater Aug. 31 to spend time with pediatric patients and leave behind a token of their support. Through their Lead the Way Foundation, the Greenways donated “Chad’s Locker,” a mobile entertainment cabinet packed with iPads, laptops, movies, and video games intended to lift the spirits of patients and their families during their time at the hospital. “We can’t change the fact that kids have to come and get treatment or go through really hard times, but we can try to distract them in as many ways we can,” Greenway said. This is the eighth Chad’s Locker established at children’s hospitals across Minnesota, Wisconsin, South Dakota, and now Iowa. Beyond the initial donation, Greenway’s foundation works with each of the hospitals to ensure the lockers remain stocked with the latest movies, games, and technology. During an accomplished NFL career with the Minnesota Vikings, Greenway became as driven in philanthropy as he was on the football field. He founded the Lead the Way Foundation in 2008 to benefit pediatric hospital patients in the Twin Cities. The organization hosts the annual TendHER Heart Luncheon to honor mothers of chronically and critically ill children, helps pediatric patients live out their sports and vacation wishes through its Field of Dreams program, and has established two accessible playgrounds for kids with disabilities. The foundation has raised more than $2 million in its 10 years and has benefitted nearly 375,000 people in the Twin Cities, according to the organization. Greenway retired from football last year after 11 seasons in Minnesota, where he was a two-time Pro Bowl selection and finished fourth on the franchise’s all-time tackles list. Before he became a first-round draft pick, however, Greenway arrived at Iowa as an unheralded farm boy from Mount Vernon, South Dakota. Under coach Kirk Ferentz, the former high school quarterback developed into an All-American defender and one of the most decorated linebackers in school history. It was also at Iowa where his passion for giving back took hold. Greenway says Ferentz and his staff instilled in him the values that still define him. When flooding decimated Iowa City and the UI in 2008, Greenway returned to Iowa City to assist in cleanup efforts and present a check for $30,000 from his foundation and the Vikings organization to Johnson County flood relief. That same year, he donated $100,000 to Sanford Children’s Hospital in Sioux Falls, South Dakota, for pediatric cancer patients. The Vikings named Greenway the team’s Walter Payton Man of the Year recipient four times for his work in the community, and he earned the NFL Players Association's Byron “Whizzer” White NFL Man of the Year Award in 2015. Just last year he accepted the Big Ten’s Dungy Thompson Humanitarian Award for his off-the-field contributions and was recognized by the Iowa Farm Bureau on the America Needs Farmers Wall of Honor at Kinnick Stadium. This marked the first visit to Stead Family Children’s Hospital for the Greenways and their four young daughters, and they were on hand Sept. 1 when the Hawkeyes played Northern Illinois in the season opener. Chad said he was not only looking forward to watching his Hawkeyes in action, but also taking part in the Iowa Wave—when fans and players turn to wave at patients on the upper floors of the children’s hospital at the end of the first quarter. To support UI Stead Family Children’s Hospital, visit givetoiowa.org/children.